As my due date with Alessandra approached, I became obsessed with my Babycenter Birth Club. I logged in at all hours of the day to read birth stories, wondering what her story would be. 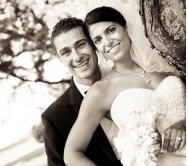 For this reason I share with you the story of Alessandra’s birth. The experience could not have been better or easier. Thursday April 4 and Friday April 5th I had contractions in the evening that stopped when I went to sleep. Friday and Saturday I kept very busy and active, walking around the city and playing with Raffi. I went to bed Saturday night feeling like I could finally breathe, which I knew was a good sign that the baby was getting into place for delivery. Sunday morning, April 7th, I woke up around 2:30 AM with contractions. Remembering my birth with Raffi, I tried to get as much rest as I could. I managed to fall asleep between the contractions I had which were 5-10 minutes apart and about 30 seconds long. I also had some other signs that this was the real deal. Around 9 AM the contractions came more consistently, about 4 minutes apart for 45 seconds at a time. I sat in a warm bath, bounced on my exercise ball, and tried to sing while working through contractions so as not to scare Raffi. I felt bad not giving Raffi the attention he needed and I was in a lot of pain, so we headed to the hospital around 1. We checked in and I was 4.5 cm dilated, almost completely effaced, 0 station. My waters did not break, just like with Raffi. At 5 PM I chose to get an epidural and have my waters broken, completely out of my own choice. I wanted pain relief and I felt confident it would help me progress and that I would not require a c-section. I was right and between the two – the epi and having my waters broken- I progressed quickly. At 8 PM I felt a lot of pressure and didn’t think I’d be able to wait for the doctor to push. I was complete with a cervical lip and the baby was still at a zero station. I tried to hold her in but I couldn’t not push. The doc came in and with just a few easy pushes at 8:34 PM our daughter was born. 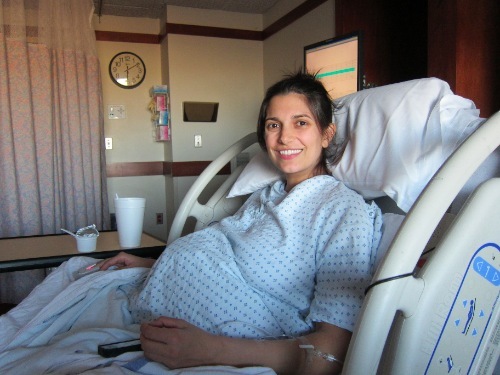 I immediately felt relief, and when my epidural meds wore off I still felt great. 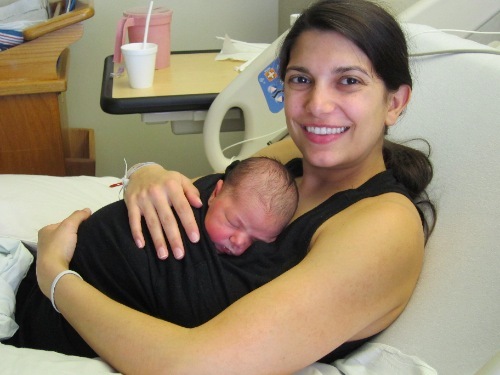 Alessandra didn’t come out screaming like crazy like Raffi did, and her Apgar scores were much lower than Raffi – they were a 6 and an 8 compared to Raffi’s 9/9. And she’s bigger than him! She weighed in at 8 lbs 4 oz and 21 3/4″. I already love our daughter Alessandra Rose so much, and I’m so happy she was able to enter the world in such an untraumatic way. I wrote this 12 hours later while she was asleep on my chest. We are both happy and healthy. Life is good. – Alessandra came out with “no tone” (she was a bit floppy) but when the pediatrician said that we misheard it as “no tongue” and were panicking. We had a good laugh about that later and feel very lucky it wasn’t true. – After her birth I wore a cheap XXL black Target nightgown again, and again it was a great choice. Alessandra could tuck right in for skin to skin, and I felt comfortable the whole time in the hospital. – While recovery was easy the first time around, it was even easier this time. I already feel quite normal physically aside from the pelvic muscle that was already damaged from Raffi’s birth and had never fully come back to normal. Our 2 flights of stairs to our house has not been a big deal, and I’ve been able to carry Raffi, go for walks, and do normal activities with ease. – It is awesome to not be pregnant anymore. That was a very, very long 9 months and I’m happy it’s over. 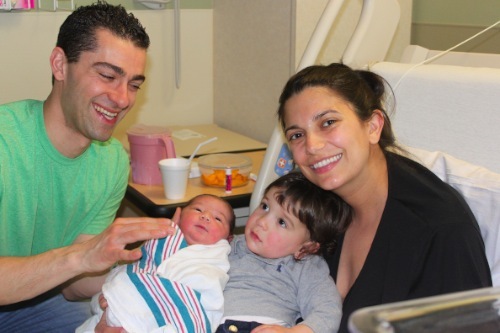 – When the doc handed her to me I immediately said she looked just like Raffi, and everyone in the room made weird faces. It took me a minute to realize that my doc’s name was Dr. Raffi and they didn’t realize we had a son with the same name. – I was overly emotional when they handed Alessandra to me, and just like with Raffi I said some silly things. The funniest thing I said was that I wanted to lay her on my chest like a squirrel. I’m still not sure what that means. 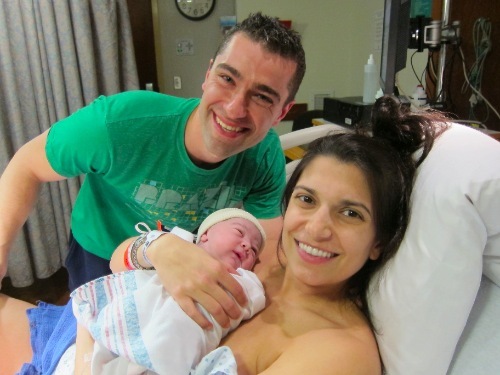 Alessandra’s birth could not have gone better. We are both healthy, recovery is going great, and I don’t have any regrets. Now it’s time to figure out life as a mom of 2! congrats! can’t wait to hear about the juggling of 2 under 2! Congrats again and thanks for sharing! I’m so happy for you and you seem so happy. Good luck with everything! I am so happy for you and your beautiful family! Oh, S. That is so much good news to read in one place. She’s beautiful and good for you to being so in tune with what you wanted/needed. Mazel tov! Congrats!! I’m so happy it went smoothly for you. 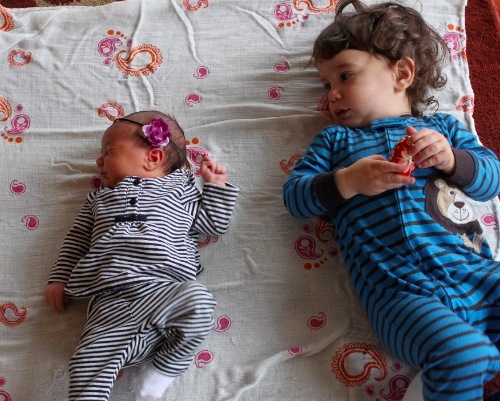 I’m from Raffi’s birth club, my son was born 9/29/11 and also had a daughter, but she’s 4 months old now – so they’re only 14 months apart. Congratulations! I’m glad you had a great experience. 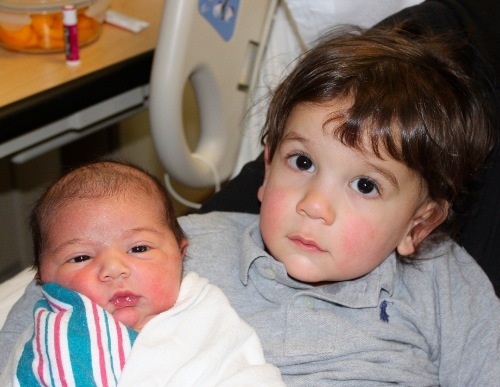 Can’t wait to hear more about the adjust to having two and how Raffi is doing with his little sister. I’m expecting my second this summer, my daughter will be 25 months old. Little nervious about it! I giggled at your squirrel comment. Hehe! I’m so glad Alessandra’s birth went so well and smooth! Wow, I didn’t know you could push at 0 station? You’re kind of a rock star. Love that this was so easy and happy. I know you didn’t have the birth you envisioned with Raffi and it’s just so good to read how content you are with this one. Also LOL to the squirrel comment and Dr. Raffi thing. What a fun family you guys are. I didn’t know I could push or would have the need to push at a 0 station either (especially not with pain meds!). I did though and in 3 contractions she was out. Crazy right? Just like with Raffi the nurses commented on my look of determination when I was pushing haha. So I went for the pain meds but it was my choice – I feel happy about it! It was such a great experience for me this time around. P.S. You look so good after delivery! I love the black XXL idea. When I first saw that photo I thought it was this fancy wrap shirt thing I saw on Pinterest. Your version is much more clever and affordable! Thanks so much for sharing, Sabrina! I’m so happy for you and your little family. And it’s hysterical that the doctor’s name was Dr. Raffi! So happy for you and your family, Sabrina! Great birth story! I ready so many horror stories out there it’s nice to read a non-crazy birth story! Congrats!! What a wonderful birth story! Congrats Sabrina! She is beautiful! Great birth story! Love seeing you so happy. Also, are you wearing the pajamas from Target in the third picture with you and Alessandra? It looks so cozy and perfect for skin to skin, and I’d love to duplicate it, but I can’t figure out how it works. It looks like a tank top with a Moby attached. Also, you look amazing right after birth! I am so glad it went so well for you! I’m due to give birth in the next few weeks and it’s so nice to read so many different stories and experiences. While I’m hoping for an unmedicated birth, I’m keeping my options open because sometimes other ways work out better. Thanks for sharing! Beautiful story! I’ve always been a birth story addict-love reading them. What a gorgeous baby girl she is and such a wonderful family! Also- love the part about saying she looks like Raffi and “no tongue”! Both those things made me laugh, but I’m sure it was scary for you at the time with the whole “no tone” situation. Congrats again! Congratulations!! Your little girl is absolutely precious!! You have a beautiful family and you look fantastic. I’m so glad you had control over the birth this time around compared to Raffi’s. Man, I delete my twitter and I’m a week late on this! Congratulations!!! The birth story sounds amazing. Congratulations again to your beautiful family! Wonderful story! Great job! I am very happy for you. I have been following your blog off and on since we were pregnant around the same time (my daughter Amaré was born 10/6/11).